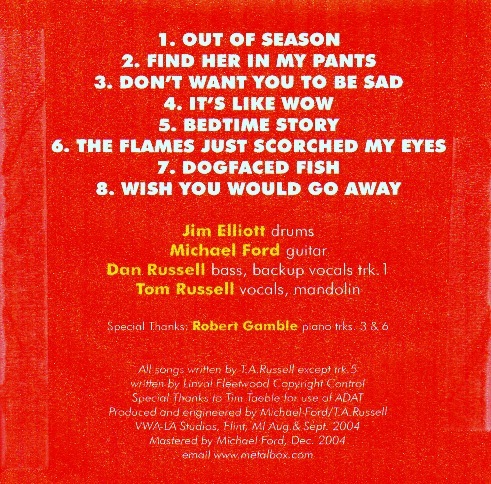 This was a project we did primarily because Jim Elliott wanted remade digital recordings of our songs. I had been jamming with Michael Ford for a while, and decided that the songs might sound better with more conventional guitar leads. Mike is an exceptional guitarist known for his shredding. We had the band together for a while before my brother Dan showed up to play bass. Fido was the original Bass Player and did the live shows. Dan was only on this recording. Basically the same songs with better production (ADAT & Pro Tools). I sang the songs with a more country flare because we were into that at the time. use it when he talked about the band.